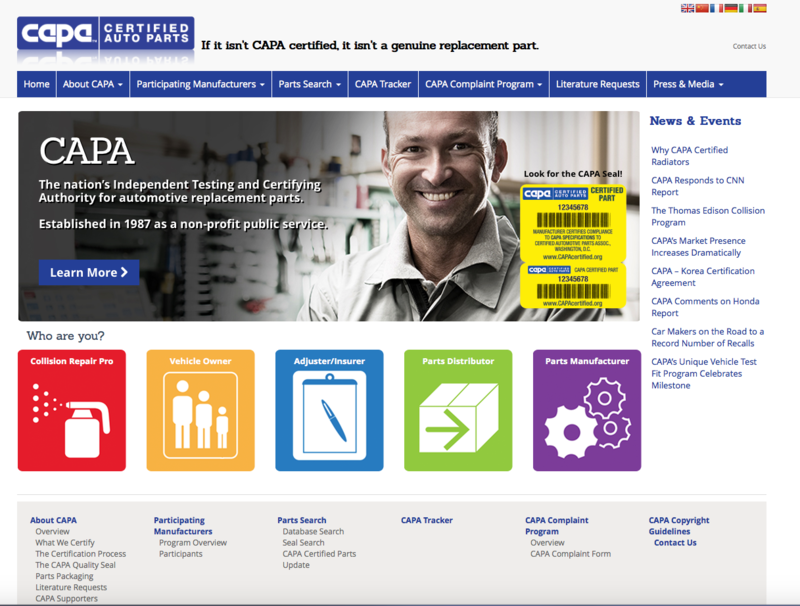 In addition to its heavy schedule of parts testing as the nation’s leading independent testing and certifying authority for automotive replacement parts, CAPA has also been busy behind the scenes updating and upgrading its web presence. CAPA’s website, capacertified.org has been completely updated with a totally new look, increased functionality, and more information than ever before. Collision repair professionals, distributors, insurers, parts manufacturers and consumers can quickly and easily zero in on the information they need to make an informed choice when it comes to collision repair parts. Whether searching for a part, or looking into the science behind CAPA’s comprehensive testing program, capacertified.org provides a fully transparent look at the one part certification program that has made a significant improvement in the quality of aftermarket parts that carry the CAPA Quality Seal. As the world’s pre-eminent aftermarket part quality testing program, CAPA certification provides proof of quality, safety and performance. “It’s not easy to earn the yellow and blue CAPA quality seal,” said Debbie Klouser, CAPA’s Director of Operations. “The new capacertified.org is more than informative, it can save shops, distributors, insurers and consumers from serious problems down the road,” said Klouser. ← Where Are the Worst Drivers?